Little Italy is a lively urban village comprised of single-family homes, condominiums, apartments and a variety of restaurants, cafes, galleries and boutiques. The Little Italy sign hangs prominently over India Street in the center of the neighborhood. A stroll down India Street will delight the senses with the aroma of delicious Italian food, coffee and sweet deserts. One immediately notices the sound of the Italian language being spoken, beautiful flowers in pots on the corners as well as haning from the street lamps. A consistent them of Italian American culture is prominent from famous Italian-American characters hanging on banners of the light posts, the many Piazzas that are dedicated to historical figures and the prevalent importance given to art throughout the community. There are beautiful fountains, sculptures and paintings sprinkled throughout the neighborhood that make one realize they are in a community with a strong theme of Italian American culture and history. Whether it be for coffee and dessert, wine and appetizers, happy hour, or a multi-course meal, the cuisine of Little Italy will thrill your taste buds. With fantastic annual events such as Art Walk, Festa and Carnavale and the weekly Little Italy Mercato farmer’s market and stick ball games, Little Italy is alive with culture. 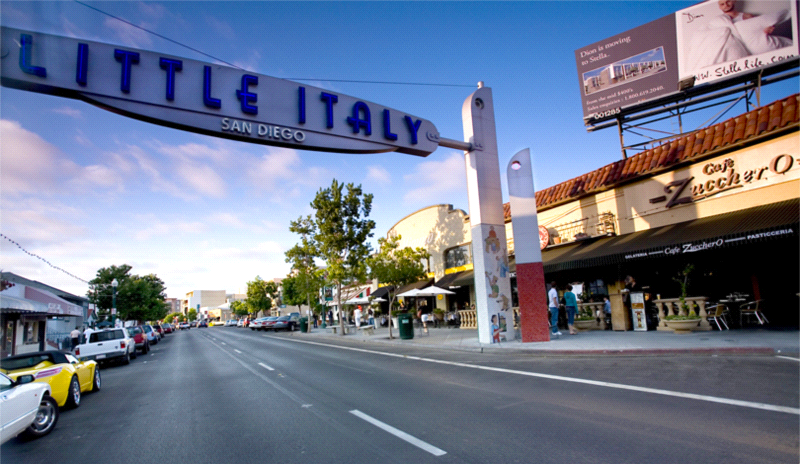 Residents of Little Italy have the best of downtown San Diego right at their fingertips. Little Italy is located at the north-western most end of downtown, minutes away from the San Diego bay and Embarcadero, the San Diego International Airport, the historic Gaslamp Quarter, and with convenient freeway access. Little Italy condos provide a variety of living opportunities in this unique neighborhood. The residential condos for sale include high-rise propeties, mid rise properties, lofts and garden style low rise living options. Because Little Italy is located close to the flightpath for the San Diego International Airport, most of the properties are 6 stories or less due to height restrictions from the Federal Aviation Administration. One benefit to this is that streets that run North to South like Kettner, India and Columbia Streets are flooded with light and are great places for people to gather on the sidewalks to enjoy a coffee, catch up on the news, visit friends or just hang out and people watch. Little Italy condos San Diego include the following buildings: 350 W Ash, Acqua Vista, Aperture, Bella Via, Breeza, Doma, Hawthorne Place, La Vita, Palermo, Portico, Porto Siena, The Q and Village Walk. Residents of Little Italy condos San Diego enjoy a variety of amenities and conveniences. With a variety of architectural types and design styles; varying unit types including high rise, townhomes, lofts, live/work spaces and more; and a plethora of amenities, it is easy to see why so many reside in a Little Italy condo San Diego. Little Italy has more of a community feel than any other downtown neighborhood. Pet owners find Little Italy especially inviting; many restaurants provide water and allow dogs on their outdoor patios, and Amici Park’s new leash free dog park is a great place to take your dog for a walk. Contact us now to help you find your dream Little Italy condo San Diego.